Even if you don't like the Armored Core series as a series, you have to admit, those giant mechs look pretty cool. And toys based on those giant mechs are pretty great, too. This is Evangel's CREST CR-C89E ORACLE VER. (the caps is theirs, I'm not that excited), which stands 7.5 inches tall and will be out in February for $50. While technically a model kit, all the pieces simply snap together, and it comes painted. 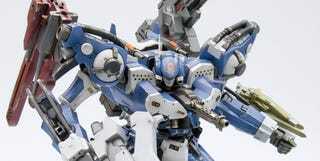 If you've got any of the other Kotobukiya Armored Core kits, you'll be able to swap out various weapons and pieces of armour for something a little more you.